On the floating city, you can be anything you dream - a novelist or a singer, a florist or a factory worker... Your life is yours to embrace or to squander. There's only one rule: you don't approach THE EDGE. If you do, it's already over. 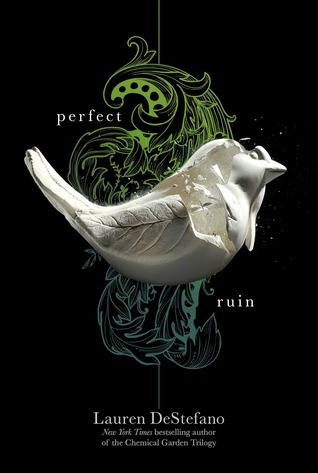 Perfect Ruin has been on my shelf for years. I actually started reading it a year or so ago, but found that I wasn't in the mood to read it. Recently I found myself really, really curious to know what was over the edge of the floating city, so I gave it another chance and I'm so glad I did! Morgan lives on Internment, a city that floats in the sky far above the earth. Around the city is something like a forcefield of wind that keeps things inside. Some people try to jump, including Morgan's brother, and they always come back changed for the worst. Despite knowing she shouldn't, Morgan has found herself wondering more and more what's over the edge and I love her for it. Morgan is the kind of YA heroine I enjoy reading about! She's smart, strong, and inquisitive, and doesn't tend to blindly rush into situations. I loved her relationships with her betrothed, Basil, her best friend, and her family. I really liked that there were so many more well-developed relationships than just the romantic one. Speaking of romance, there were a few minutes when I thought there would be a love triangle, but thankfully it didn't happen and the romance that is in the book isn't the main focus of the book. Which brings me to the absolutely amazing plot! I'll admit, there were definitely times that this book dragged. There's a lot of day to day life, walking place to place, and talking. But once things get going, they really move fast! There's also the constant knowledge that there's something over the edge. The idea that there was a tiny island and no one knew what was below it had me stressed out from the very first page and it was awesome. I was never quite sure what was going to happen. I had several theories about what would be over the edge and, though I was left with more questions at the end, I liked the direction it went. The worldbuilding in Perfect Ruin was fantastic! There was enough detail that I felt like I had a good understanding of Internment and how it functioned. Really, I feel like I could probably draw a map of it if I had to. Internment is such a unique idea and Lauren DeStefano did an incredible job of pulling it off. Like I said, this book definitely does leave off with a lot of questions to be answered. The cliffhanger would be terrible if the books weren't already published. Luckily, I can jump right into the next one to see how things turn out!